Susanne Thelen is a doctoral candidate at the Institute of Political Science at the University of Technology Chemnitz and a member of the State Executive Board of the CDU in Rhineland-Palatinate. She previously worked as a Retail Business Management Assistant, studied Business Administration and Marketing (BA), and completed a Master’s degree in Politics and Communications from the University of Trier. 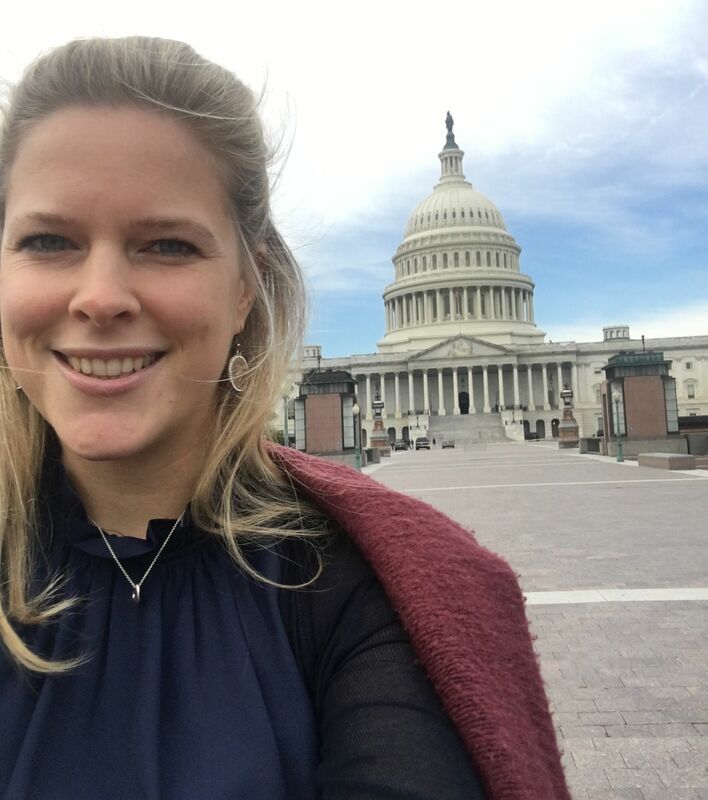 In winter 2018, Susanne participated in the DAAD-AICGS Research Fellowship Program and was based at AICGS in Washington, DC. What sparked your interest in research abroad? I am passionate about elections and election campaigns. Even as a beginning researcher, this subject fascinated me. For example, in my Master thesis, I analyzed the attacks on Twitter by then-presidential candidates Donald Trump and Hillary Clinton in the 2016 U.S. Elections. Moreover, the pioneer position of the U.S. in campaign strategies and the American influence on German campaign strategies will be an essential part of my dissertation, as the US serves in certain regards as a role model to some German parties. To gain a deeper insight into this subject, I applied for the DAAD/AICGS Research Fellowship. I stayed at AICGS from mid-October to mid-December 2018 and the midterm elections in November 2018 provided new perspectives on negative campaigning in particular, as well as other campaigning strategies. Currently, I am working on my PhD on the topic “Negative Campaigning in the German Federal Election 2017: Evidences from the CDU and SPD – An American Point of View on Negativity in Modern Election Campaigns.” Sometimes, negative campaigning is seen as illegitimate campaign tactic, maligned as a form of cheating or mudslinging – especially when the attacks refer to personal attributes or characteristics. If attacks deal with political content, they are less frequently classified as dirty campaign strategies. In my analysis, I focus on these different types of attacks. It is not surprising that when I started my PhD in January 2018, I chose the parties’ campaign strategies in the German federal election 2017, particularly ‘negative campaigning,’ as the subject for my dissertation, because in September 2017, I worked for the campaign of the CDU and Angela Merkel. Through this experience, I gained a deeper insight into party strategies and decision-making processes. My dissertation is based on a qualitative research method. Therefore, it would enrich my study if I could use information and quotes from American experts as interview partners. Talking to campaign managers, representatives of the Republican and Democratic Parties and think tanks would enhance my dissertation enormously. When I started my research trip to Washington DC, I was worried that I wouldn’t get the chance to talk to these experts. But in the end, this was not an issue at all, because AICGS provided great support in this regard. President Jeff Rathke and the AICGS program managers enabled me to get in contact with a lot of interesting and well-informed experts in the field. Moreover, the Konrad Adenauer Foundation, located nearby in Washington, DC as well and where I interned 2016 at the time of the US Presidential Elections – also hosted discussions and roundtables on these same topics that I was able to participate in. What was the most 'German' experience you have had in the United States? I stayed in the US from October to December, so when I heard there is an annual Christmas Market in DC, I was really excited, because I really like Christmas and I missed my own Christmas traditions at home. When we arrived at the market, it wasn’t exactly what I expected. There was no traditional music, no mulled wine, and no advent wreaths. However, it was a fun afternoon and at least I had a bratwurst with kraut (although I have never had it like that in Germany). Political Science is a very diverse subject. But it is not enough to be just interested in politics. Everyone should have an answer to the question, what do I want to do after I’m finished studying. Do they want to work as a journalist, for a political foundation or for the government? There are a lot of interesting jobs out there for people in the political science field. What advice would you give to North American students and researchers who are thinking of pursuing research abroad in Germany? Or alternatively to German students and researchers who are thinking of pursuing an opportunity abroad in the United States? Don’t hesitate to reach out to someone who already has experiences living or studying abroad. They can give you valuable advice on where to live or what to do and they also have a personal and professional network from which you can also benefit. Actually, I can cook a lot of German dishes without recipes, because I watched my mother or grandmother when they prepared meals. For example, the German dish “Roulade”. It is flat beef that you fill it with ham, onions, mustard and pickles. A tip from my mother: Cut the pickles into stripes not small cubes, because you need to roll the meat afterwards. Finally, fix the roulade with toothpicks and season it with salt and pepper. In the end, you cook the roulade on all sides until browned. You serve it with sauce, red cabbage and mashed potatoes. Guten Appetit! Learn more about Susanne, her research, and our DAAD Scholarships.